Where to start? Probably 5am Friday morning when I dragged myself out of bed then dragged an equally unwilling child from her bed to catch a too-damn-early flight to Melbourne. After copious amounts of coffee (for me, not my daughter), wakefulness hit then excitement – COMIC CON!!! We were bunking down at a my friends Chris and Tracy’s place (read her work – read it! 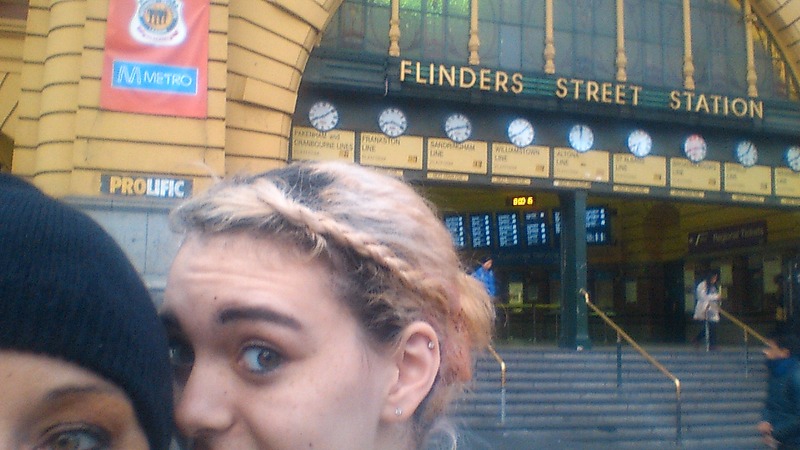 ), so Saturday morning we were again up at sparrow-fart and off to Melbourne-proper. It’s a pretty city, Melbourne, and damn if they don’t make a great cup of java (yes, this is a vital part of me liking any place I visit). As my daughter and I strolled along Southbank, it wasn’t long before we were in the midst of cosplayers – excitement level-up. 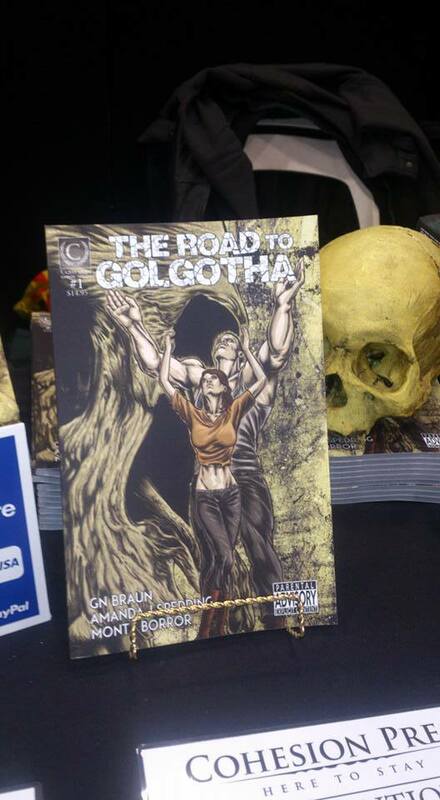 While I’ve been to Supanovas, this was my first ComicCon, and what made this all the more special was that this was the launch of my comic ‘The Road’ – part of a two-in-one comic ‘The Road to Golgotha’ with GN Braun and brought to spectacular life by the artist, Monty Borror. And when I walked up to the Cohesion Press table, there she was, pride of place and absolutely beautiful. That I was sharing this with my daughter made this even more special. Our table was beside that of IFWG Publishing, manned by the lovely Gerry Huntman, the effervescent Stephen McCracken, and one of my favourite people in the world, Robert Hood. We were in some mighty fine company. Now, I’m not a salesperson by any stretch of the imagination (kinda a design flaw in the whole being-a-writer thing), and pimping my work to strangers is hard, but the thing with ComicCon attendees is their desire to engage. There’s complete and utter acceptance of everything and everyone at cons such as these; it’s a celebration of the arts in all their mediums, and a celebration of those who love their movies, tv shows, authors, artists and all that goes with it. 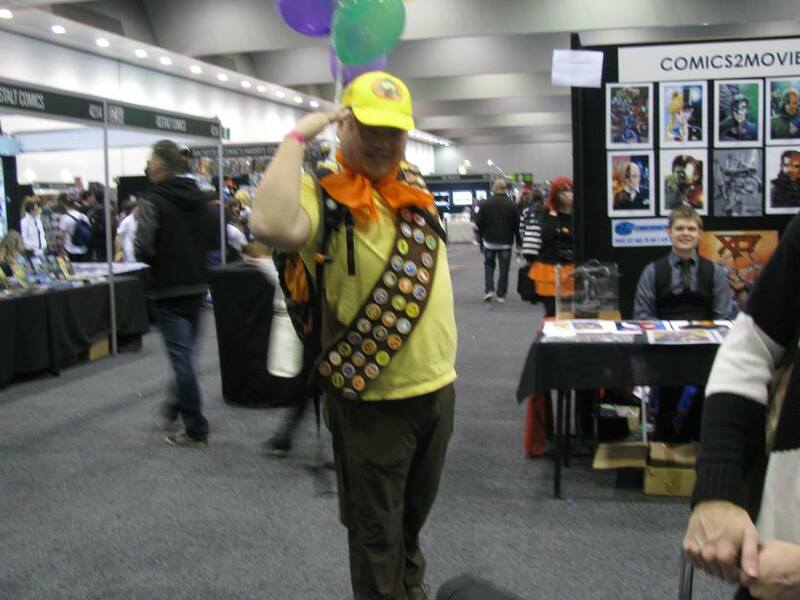 The cosplayers were just brilliant – always happy and obliging for photos; and some of the costumes just blew my mind. It was happy, happy place that nurtures creativity, and you really can’t ask for more than that. Chatting with people about the comic, explaining the idea behind the story and having people ask me questions then buy the comic was such a buzz – signing it for them as an author is a real joy. To have someone come up and buy your work because another con member recommended it? 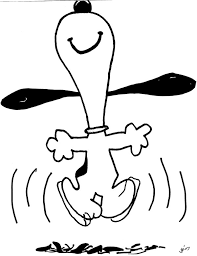 That’s the stuff of snoopy-dances. If all of this wasn’t enough, I got to finally meet some peeps I’d been waiting to for a long time, and my mate James O’Keefe (who was also working ComicCon) was first to the table. I’ve known James for… must be five or six years now, but with both of us living in different states… it was great to finally catch up in person. I knew artist and writer Jason Franks would be at the con, and that was a meet I was looking forward to, especially after reading his amazing novel Bloody Waters (get on it – it’s a killer piece! Reviewed here). While I would have liked to have spent more time chatting and to sit in on his panel – time was a hungry beast for us both. Same with Aaron Sterns – it was wonderful to finally meet and chat with the softly-spoken writer of the Wolf Creek fame. I missed his panel as well, but that’s the thing with being an exhibitor at cons, you’re there to engage with potential readers and you can’t do that effectively when visiting people you’ve been hanging to meet for a long while. But cons are also the places that allow you to have those meets with friends from other states; with the people who love what they do as much as you do. Being amongst it all brings home how much this really is the best gig in the world, and how lucky I am to be doing something that feeds my soul. None of which could have happened without the likes of Geoff Brown of Cohesion Press who believed in me and how much ‘The Road’ would be a kick-arse comic. I can’t thank him enough. I really wish Monty could have made the con, but living in the US makes it a tad more difficult to get here – he’s a very busy lad! But without him, ‘The Road to Golgotha’ wouldn’t be the stunning piece of art that it is. And to top it all off, there were two pieces of original artwork waiting for me. Two of my favourite pages from the comic that will soon be framed and up on my wall where I will love them and stroke them and love them. It was all over far too soon. Exhausting though those days were, it really lit a fire under my bum to create bigger and better, and to make sure I attend more cons to not only connect with my mates but to readers as well, ‘cause there ain’t nothin’ better than seeing someone walk away holding your book with a smile on their face. Tomorrow morning (waaay early), my daughter and I will be dragging our tired selves onto a plane for our trip to Melbourne for ComicCon. It’s a big deal, a very big deal. 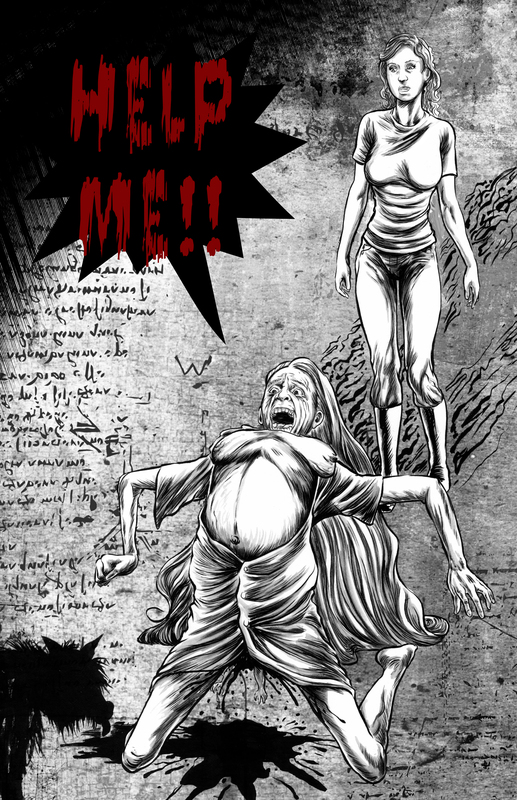 This is where the two-in-one comic ‘The Road to Golgotha’ will be launched through Cohesion Press. My story ‘The Road’, takes up 47 pages of horror-filled beauty, and while it’s uber-exciting, I don’t think it’s really sunk in yet (hell, I still haven’t started packing). It’s been quite a long road (yeah, I see that pun) to get to this point; the script was written about two years ago, taken from a short story I’d had published in Midnight Echo #9. This was the first comic script I’d written, and truth be told, it almost broke me. Comic writing and story writing are two completely different beasts, and it took me a while to wrap my head around the ‘stillness’ of a comic. A panel is a snapshot, a moment frozen in time – a character isn’t ‘running’ they are ‘mid-step’; they aren’t ‘raising their hand’, it’s either up or down. A true collaboration it is, and the gods stepped in and sent extraordinarily talented artist Monty Borror my way. It’s his art that brings my story to life, his skill and mastery of the medium that took my words and ideas and made them visually real, visually stunning. I sometimes wonder if he’s a sorcerer. 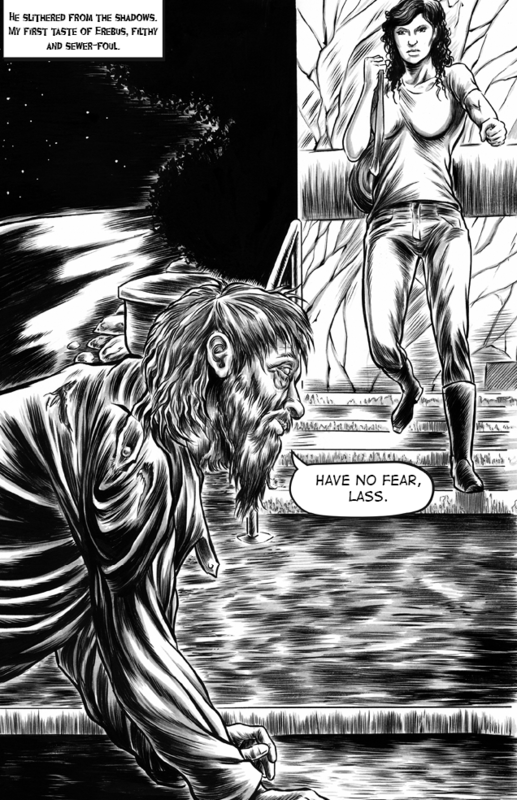 So 47 glorious pages later, Monty had finished the art, the lettering had been done, and it was off to the printers in time for launch at Melbourne ComicCon. ‘The Road’ is a story of gods and monsters, of self-discovery and a battle for identity for the heroine. It’s hard and it’s bloody and she unapologetically owns it. 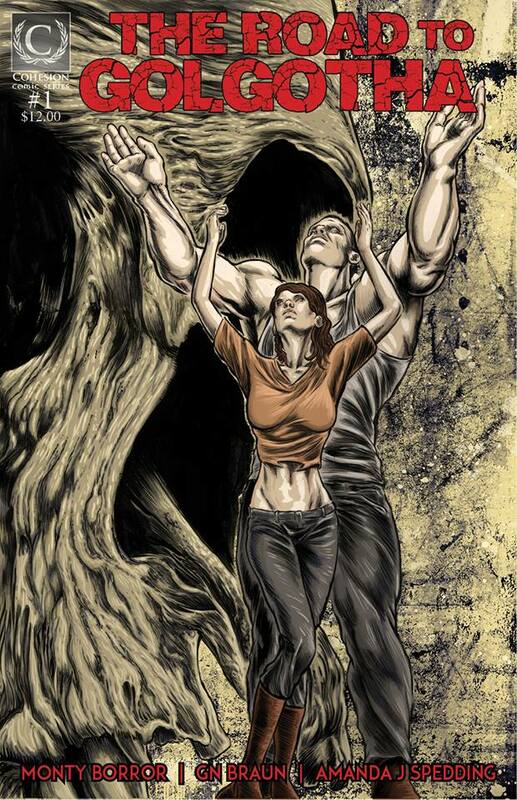 The other story, by GN Braun is ‘His Own Personal Golgotha’ – a search for redemption through horror-filled pages again brought to wicked life by Monty Borror. It’s a visually stunning piece that doesn’t pull any punches. It’s kick-arse. I also get to share this experience ­– my first ever launch – with my daughter, and that’s pretty damn special. She’s just as excited as I am, despite the fact she isn’t allowed to read the comic as it comes with a ‘R’ rating, but she’s very much looking forward to wearing an exhibitor pass and exploring ComicCon. 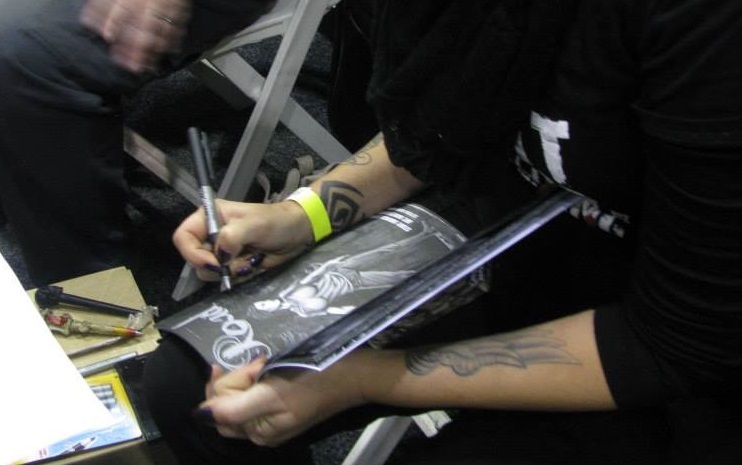 So if you’re in Melbourne over the weekend, come say hello and take a look at the comic – we’ll even sign it for you! For anyone who can’t make it, the comic will be available on Amazon next week, in either black and white or spectacular colour. Now, I’d better go pack, I have to be up in five hours. I should be writing, I should, but I’m starting to get ridiculously behind on my book reviews, which isn’t a bad thing really – it means I’m reading faster than I can write reviews… or someone’s seriously messing with time (if so – STOP IT!). EVERYONE’S SEEING SPOILERS! IT’S A SPOILER IN JUNE! THOUGH THE WORLD’S FULL OF SPOILERS, THEY COULDN’T SPOIL US EVEN IF THEY TRIED! Alrighty, let’s get to this, shall we? Imagine a world split definitively between those with differing physical attributes. Daniells’ world is ruled by ‘True-Men’, perfectly-formed and pure of blood, they believe themselves better than those unlike them. On the other side is the T’En, white-haired, blue-eyed, six-fingered people with mind-bending abilities that strike fear (and superstition) into the hearts of True-Men everywhere. Caught somewhat between are the Malajune (Wyrds), copper-haired, purple-eyed, six fingered men and women born into the service of the T’En – honoured they believe themselves to be, this indoctrination is hard-wired into them through history. But the above is just the main structure, the loom if you will, of a rich tapestry of lives and loves, culture and magic that hold this world together. Daniells weaves her world with care and precision, but one tug at those threads and it all unravels, as we will come to see. At times the precision of Daniells’ world-building worked against the forwarding of the story, especially within the first one-hundred and fifty or so pages. I understand the need for this world-building at the beginning of a trilogy, but there was a lot of information I felt could have been drip-fed through the story, not spelled out so completely with those early chapters. It’s all about balance, and that Daniells’ storylines for the characters were so compelling, it was sometimes frustrating to feel bogged down in some of her descriptions when I wanted to follow the characters through their stories. Besieged is told from several points of view, and works well to give us a taste of the different people that make up this world. While Imoshen takes somewhat centre stage for the trilogy, it’s the character of Sorne, the disavowed son of the mad king, Charald, to whom we are first introduced as a babe – I’m talking straight from the womb and (almost) directly to his father’s blade. It’s with Sorne we spend the beginning of the book; saved (and raised) by former High Priest Oskane – for purely selfish reasons, mind – he is an experiment in the abilities of the Malanjune to find a way to defeat them. Tortured and indoctrinated into subservience, Sorne’s is a pitiful, yet strangely happy childhood, until he becomes aware of who he really is. Things really go from bad to worse when he delves into the higher planes where monsters dwell, and becomes an even greater pawn in Oskane’s plans for revenge. Running concurrently with Sorne’s story is that of Imoshen. The T’En’s are also a divided race – the Sisterhood and Brotherhoods (yes, men and women split with power-plays happening all the time). History has the Sisterhoods raising all children, with the boys moving to a Brotherhood when they come of age. It’s an interesting dynamic Daniells plays out here – each Brother and Sisterhood has its own standing, but each also vies for greater standing and power with the T’En. Each T’En also has their own gift, which can range from being a Warrior, Healer, and taster of truth to communing with animals (which is so low on the scale, it’s considered tainted). Those within the Brotherhood usually have children with Malanjune, and Imoshen was not handed over to the Sisterhood as per law but raised by men. Though loved by her father, she too, is a pawn in bringing prestige to the Brotherhood but the pact was broken and… well, all hell breaks loose when Imoshen arrives at the Sisterhood after escaping a murder-plot. Besieged is the set-up book for Daniells’ created world, characters and the story arcs of said characters. It’s a bloody, in-your-face world that doesn’t shy from the harsh reality of a world that is bound by rules and laws that at times seem unfair, but so far have worked to keep the peace. Of course you know that the peace is going to be broken, that there are those within the book who will set out alone to make their own destinies, even when they are tied so tightly to the people they’re meant to be guiding and protecting. It’s no secret that the Mad King Charald wants the city the T’En occupy – beautiful and bountiful that it is. He’s determined, ruthless and uses the magic and history of the gods to further his cause while taking wife after wife in an attempt to sire the perfect True-Man son. There are parts of the book I’d like to mention here, but they’re also parts as a reader you should discover yourself. Daniells has woven an intricate world and characters that are wholly likeable and unlikeable, but there’s an honesty to this world that I really enjoyed. While it sits squarely within the fantasy genre, there’s a darkness and brutality to it that won’t appeal to all fans of fantasy. For me, though, I liked that unashamed storytelling. Lives aren’t all pristine and happy unicorns, that if you look hard enough, you’ll see the cracks in those veneers and the dirt that hides beneath. As I said earlier, there were times where I felt the story suffered a little under the weight of the world-building, but that’s a personal preference. Daniells’ world is extremely well constructed, the magic systems and culture, though unique to each race, they’re cleverly entwined and deftly delivered. There’s political and religious power-plays, revenge, betrayal, love and horror all finding their place here — a little something for everyone. It’s difficult to express within a thousand-or-so words how good this book is (without it turning into a dissertation), but I’d highly, highly recommend this series. Daniells said she wanted to write a trilogy that had the reader wanting more, and she definitely delivered with Besieged. I finished the book (which is 672 pages) in about five days because I wanted to spend more time with the characters in this beautifully fucked-up world.